Did you know that most people use their garage door more than their front door in the Myrtle Beach area? Your garage doors appearance can increase or decrease the re-sell value of your home by up to 3-4%. We stock most garage door sizes in both raised panel and bead board “carriage style”. Want glass in your garage door? No problem, we can install it for you. Should you need a garage door repair, we are the one’s to call. We stock most parts to repair your garage door or operator and most repairs are done within 24 hours. Carefree offers Myrtle Beach a full line of residential and commercial service work, repairing a variety of garage doors and garage door operators. We stock a full line of garage door springs, hardware, and many operator parts. 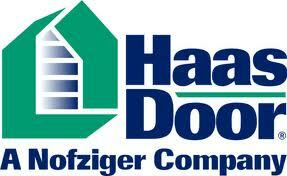 We install high quality Haas, Hormann, and Amarr Doors. Concerned about high winds during a tropical storm or hurricane? We can get your door ready by adding hurricane struts and hardware. We handle most all service within 24 hours. Contact us for all your service needs. Carefree offers a wide range of style designs such as raised panel, flush and carriage house designs to meet your design needs. We stock a broad variety of door sizes and options to enhance the beauty of your home. Need a custom size? We can custom make most door sizes. All our standard doors come in a choice of 24 gauge or 25 gauge galvanized steel with a baked on enamel finish. Most doors have a limited lifetime warranty on the sections. There are up to eight (8) color options available on most residential raised panel designs. Sections are made with the pinch resistant design. You can view the various styles on-line at hormann.us or amarr.com. With a garage door screen you can enjoy the benefits of the coastal Carolina climate. 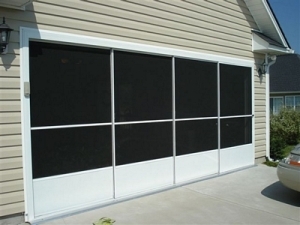 Carefree Exteriors sells and installs the finest quality garage screen doors in the market. These garage screens add living space while adding value to your home. Carefree offers a variety of different manufacturers operators. We highly recommend the technology of the silent drive Hormann. The Hormann converts AC power to DC power in the motor head for an extremely quiet operation. The Hormann motor is belt driven and eliminates the plastic gear assembly that tends to need replacement over time. It comes standard with a deluxe wall button station and a remote control with a four (4) button remote control that can operate up to four (4) doors with one remote and is also HomeLink compatible. Need more than one (1) remote or a keyless entry pad? We keep them in stock. This operator has a lifetime warranty on the motor (see warranty sheet for details). Other operator brands that we carry are…Lift Master, Marantec and Linear.